During a recent visit to my local salon, I emerged from my hair cut to see my eleven- and seven-year-old sons in the reception area with noses buried deep in hard covers of “The Red Pyramid” and “Captain Underpants.” There’d been an all-electronics ban that morning, so my heart skipped a beat when I saw them reading with a focus that only the words “doughnuts” or “free Legos” could disturb. What thrilled me most was that an older, mentally challenged man sat reading over my younger son’s shoulder, tugging at my son’s book and laughing with gusto while spit dropped onto the flipping pages below. My kid never moved a muscle. He looked wary and didn’t engage the man in conversation, but he calmly stayed put. I was feeling a strong need that morning to connect with humanity, and in my experience, it’s easier to connect with someone without pretense. With that in mind and with my older son’s 3-inch high hair now meeting #1 blade clippers, I begin to pepper the man with questions. What was his favorite Captain Underpants book? Was he getting his hair cut? How long did he think the crowd at the bus stop had been waiting for the NYC bus in the 100-plus temperature? I can’t understand anything he says in response. I nod, smile, and send my eyes back down to the pages of Captain Underpants. That word always brings me back to the long street where I grew up. I’m about ten years old and walking to a friend’s house. There’s a large group of high school kids gathered at the top of the street, with my friend’s older sister twisting her body spastically and falling to the ground. She hobbles toward me, falling over at my feet, and loudly blurts out the United Way commercial catch phrase of the 1970’s “Thanks to you it’s working – the United Way.” Her friends laugh, except for one who tells her to cut it out because she’s scaring me. My friend’s sister continues twitching and grunting below me. With every rapid jerk of her bent arms and legs, a sharp pain cuts through my body. She must know. I’m different too, just like the kids in the United Way commercials. Half Jewish/half Catholic, unlike my fully Catholic neighbors with five to 12 kids in a family. We have three kids, no Christmas tree, and two Aunts with Downs Syndrome. I say nothing and walk on. I attempt to describe the word ‘retarded’ to my son. Aunt Suzanne is retarded, meaning her brain works differently, slower than ‘normal’ people. 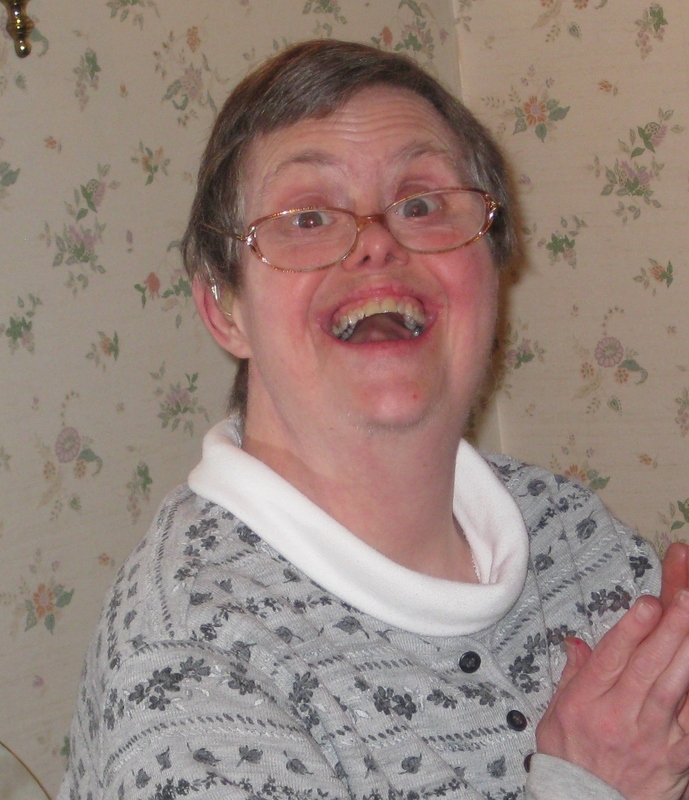 But, as she says, “I’m retarded, but not stupid.” She laughs, hugs, and loves without reservation. She has no filter of looking good. “You’re my favorite,” she says to whoever has just engaged her in conversation or returned a hug. And she means it every time. “So, who’s really retarded?” I whisper angrily from my lips. “Everyone has a gift,” he says. The day brightens. My heart overwhelms with love for him, Suzanne, and Mrs. Vascimini. Suzanne’s gift is her fearlessness. As she sits at my mom’s kitchen table, meticulously filling in the pages of her Barbie coloring book, she’ll gently touch my forearm, look up and smile. She never stops to worry what if I don’t smile back or put my hand on top of hers. There are no such rules for her. That’s one of the many reasons the word retarded has always pissed me off. Shouldn’t we be more like those that hug with a force that almost knocks you over rather than those of us whose hugs are wrapped in fear and restraint? As we ‘mature,’ we kill our souls with our own insularity, blaming others for our own pain and isolation. Suzanne knows better and always has. The older I get, the more I realize she’s someone I want to and need to emulate. The only fear is the one we give life.